Cave research, encompassing the study of speleology and biospeleology, is still in its infancy in India. Although there are thousands of caves in India, research expeditions occur in few states. The Siju Cave of state Meghalaya is the first limelighted natural cave from India. Several studies were carried out in this cave in the early 20th century. The Kotumsar Cave of Central India is one of the most explored caves of India, and biologists have classified many types of cavernicoles, i.e. trogloxenes, troglophiles and troglobites, from this cave. The Indian institution mainly engaged in this particular field of research and conversational issues of Indian caves is the Raipur-based National Cave Research and Protection Organisation (founded and headed by Dr Jayant Biswas). The other notable organisation is Meghalaya Adventurer Association (founded and managed by Brian Dermot Kharpran Daly) which mainly involved in the caving and cave explorations of the existing caves of the state Meghalaya. None of these have been studied scientifically yet. New Cave in Raisen District,Few Ancient caves of Madhya Pradesh are well known. Few more caves have also been recently limelighted. The Indian state, Meghalaya is famous for its many caves, which attract tourists not only from India but abroad too. A few of the caves in this region have been listed amongst the longest and deepest in the world. Most of the caves of these areas were either discovered or surveyed by the Europeans (especially by German, British and Italian cavers). Herbert Daniel Gebauer, Simon Brooks, Thomas Arbenz and Rosario Ruggieri are the most prominent name among them. Brian Khapran-Daly of Meghalaya Adventure association have expedite most of the caves of Meghalaya (stated above). In addition to these, the cavers' associations of Meghalaya have always been found to be active in cave discoveries of that plateau. Pandkholi Cave in Ranikhet district. Patal Bhuvaneshwar Cave in Pithoragarh district. Rai Cave in Pithoragarh district. Shivam Cave in Pithoragarh district. Sukhram Cave in Bageshwar district. and many more scientifically unexplored caves. In India, many caves are popular tourist sites. The caves of Ajanta, Udaygiri, Barabar, Undavalli, Pandavleni, Ellora are famous for archaeological finds and ancient architectural value. The stalagmite formations present in most natural limestone caves resemble Shiva Linga, a representation of Hindu God Shiva, due to which some of the caves in India are considered of religious import. In addition, several universally known caves related to Buddhism is also exist in India. The same attraction leads local people to visit small caves as it draws tourists to large show caves. In India, Amarnath Temple caves, Vaishno Devi Mandir, Badami Cave Temples, Hulimavu Shiva cave temple, Mahakali Caves, Mandapeshwar Caves, Pandavleni Caves are some of the caves with religious importance. Jayant Biswas and his contemporaries continue to research the biospeleology of Meghalaya, Chhattisgarh, Uttarakhand and Western Ghats to establish India amongst other notable countries on the cave map of the world. Research is also taking place on Indian cave stalagmites, to estimate the past monsoon climate. Dr Ashish Sinha of California State University is taking major steps to understand the past pattern of Indian monsoons via cave research. In addition, Prof. Rengaswamy Ramesh; Dr. M. G. Yadava of Physical Research Laboratory, Ahmedabad; Prof. Bahadur Kotlia of The Durham, Kumaun University Nainital; Dr. Syed Masood Ahmad & Mahjoor A. Lone, CSIR - National Geophysical Research Institute (NGRI), Hyderabad; and Dr. Jayant Biswas, National Cave Research and Protection Organisation, India, also initiated some research in this direction. Besides Dr. Biswas, Prof. G. Marimuthu of Madurai Kamaraj University, Madurai (Chiropterology - study of Bats); Prof. Y. Ranga Reddy Acharya Nagarjuna University (micro Crustacean: Taxonomy); Dr. Daniel Harries of Edinburgh (Cave Biodiversity) and Dr. Adora Thabah of Bristol University (Chiropterology - study of Bats); Prof. R. K. Pradhan Pandit Ravishankar Shukla University of Raipur (Chronobiology); Prof. Ramanathan Baskar Guru Jambheshwar University of Science and Technology, Hisar, Haryana (Cave Geomicrobiology) are some of the known researchers who have tried to shed some light on the Biospeleology (study of organisms that live in caves) of Indian caves. Unscientific quarrying of limestone led to the collapse of the Mawmluh cave of Meghalaya, and the caves of Jantia Hills are also in danger due to excessive quarrying of coal. Various caves in Central India serving as major religious spots are also either under threat conditions or somehow polluting the ambient environment. The 'National Cave Research and Protection Organisation, India' has been formed to help protect the caves of India. This organization has already urged the Indian government to frame a proper Cave Protection Act. In addition, members of the Meghalaya Adventures Association (principally, Brian Kharpan Dally) work to protect the natural caves of Meghalaya. ^ "Kotumsar Cave biodiversity: a review of cavernicoles and their troglobiotic traits". Biodiversity and Conservation. 19: 275–289. doi:10.1007/s10531-009-9710-7. ^ "National Cave Research and Protection Organisation". caves.res.in. ^ "The Tribune, Chandigarh, India - Jobs & Careers". tribuneindia.com. ^ "A caver's sojourn". The Hindu. Retrieved 9 May 2016. ^ "Caving". Adventure Nation. Archived from the original on 2015-07-04. ^ "Ramesh petitioned against Lafarge plant in Meghalaya". Times of India. 16 November 2010. Retrieved 2010-11-19. 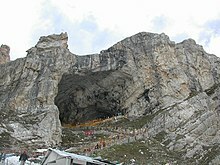 Wikimedia Commons has media related to Caves of India. This page was last edited on 26 March 2019, at 12:54 (UTC).